Can you read the title? It’s says ‘I’m bringing birthdays back’ – which is a hashtag (a social media thing) started by Shannon West of our Stampin’ Up! home office. Shannon was even interviewed on television, talking about her movement to bring back the wonderful practice of sending a real, snail-mail birthday card to someone, instead of the ubiquitous Facebook post. You can read Shannon’s explanation HERE, in a blog post. But seriously – if all you got from your BFF, or significant other was a HBD on Facebook, you’d probably feel a bit slighted. 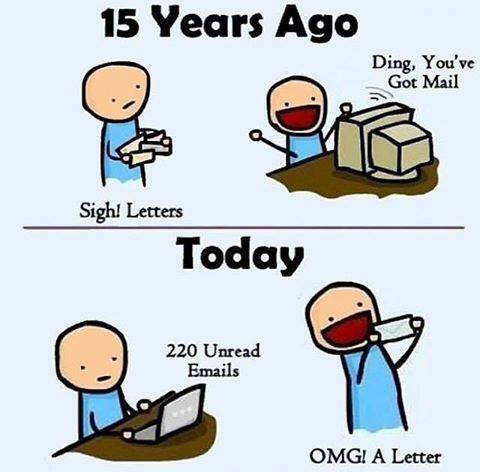 There’s nothing – I mean nothing – that can replace the joy of opening your mailbox and finding that smooth, glossy envelope, with your name handwritten on the front! The anticipation of opening up the envelope, and pulling out a card that was – if not hand made, then at least hand selected, especially for you! I shared this cartoon on my Facebook page (yes, I get the irony) last week, but I realize that not everyone (really – NOT everyone!) is on Facebook, so I wanted to share it with you here. See what I mean?! That happy face!! Social media is all good and fine, but it does lack the personal touch. Which brings us back to Shannon’s #imbringingbirthdaysback movement. I’m joining the movement, and I want to send YOU a handmade, handstamped card – made just for you – from ME! All you have to do is click the ‘Contact Deb’ button, which will start an email – my email address is debsmart@shaw.ca – give me your name, address and birth date (no year required! ), and I will do my utmost best to get your birthday card to you, on your birthday! You don’t have to live in Canada (which is where I am); international mail is fun, too! And if you want to join in on the #imbringingbirthdaysback movement, Stampin’ Up! has taken Shannon’s pledge to heart, and create THIS stamp! 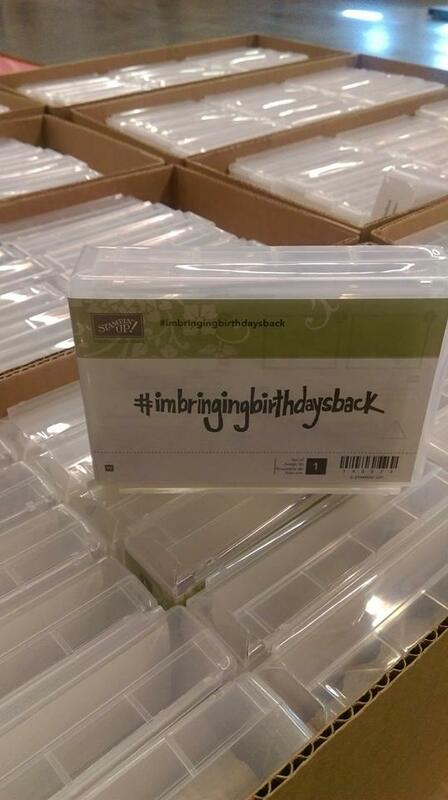 If you think this looks like a pallet of#imbringingbirthdaysback stamps, you’re right!!! At MIDNIGHT tonight–March 1 (MT) you can buy the stamp (item 143573). It’s while supplies last…and supplies are very limited. If you want one, I’d be ready to place an order at midnight…that’s what I’ll be doing! Supplies are limited – so if you want to grab one of these trending – and trendy – stamps, you’d better be ready to place your order! Better yet – shoot me a quick email NOW, and I’ll include your order with mine! (I don’t know the exact price yet – as soon as I find out I’ll let you know. Someone did mention a price of $12 U.S., but I’m not sure). Next Next post: Blogging Friends Blog Hop – Where Does It Happen?